The weekend of April 27 and 28, brought around the first weekend of junior high rodeo in Rapid City, S.D. Game times for our GBB/BBB doubleheader with Lead-Deadwood havechanged due to the forecast for Sat. evening in the Black Hills.Varsity GBB. will start at NOON and be followed by the Varsity BoysJV games are cancelled. On Saturday, April 28, the Bennett County track team traveled to Platte to compete. The Bennett County Lady Warriors picked up their first win of the season with a 48-40 win over Hay Springs Jan. 2 in Martin, led by Lexi Bair’s 17 points and Rachel Ireland’s 9. Karissa Rayhill, a Martin local and freshman at Eastern Wyoming College, has done what she set out to do; qualify for the College National Finals Rodeo. 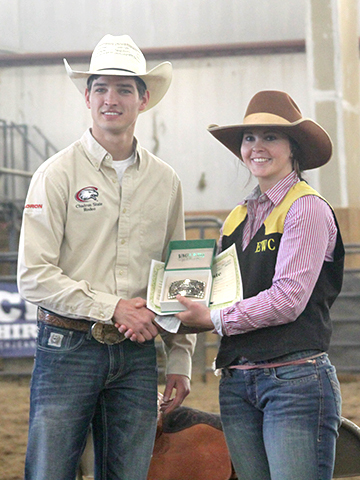 Over the past weekend, April 27 and 28, the Eastern Wyoming College team headed to the University of Wyoming in Laramie to compete. In the first round of goat tying, Rayhill tied for 3rd and 4th with a 7.3. The Bennett County boys high school basketball team picked up their first win of the season with a 60-51 victory over Wall Saturday in Martin. No stats were available by press time for that game. On Friday night, the Warriors hosted Winner and looked good early, leading most of the first quarter, then settling for a tie at eight heading to the second quarter. The Girls Basketball game against Kadoka set for Thursday, Febraury 15, has been cancelled. Parent's Night will be held Monday, February 19, before the boys game against Red Cloud. Bennett County placed fifth out of 25 teams at the powerful Mid-Dakota Monster Wrestling Tournament in Presho Jan. 5-6. Tyler Byrne had an outstanding day on the mats, claiming the 195 pound title in good fashion, pinning Tyler Resick of Kimball/White Lake/Platte-Geddes in 4:36 in the finals.